*slides in at the last minute* Here's my rec list for the hc_bingo March challenge. My rec list had to include fifteen fics featuring the prompts 'comfort food or item', 'surgery', and 'clones'. This was actually much harder than I expected. Although it might have helped if I hadn't left it until quite such the last minute to finish putting the list together. Summary: Becker is absolutely not mooning pathetically over his coworker Jess, but he makes her a lot of chocolate pastries anyway. Bakery!AU. Why I’m Reccing This: I’m generally a little wary of AUs, but this one works so well because the characters are still very much themselves, just working in a bakery and making cakes rather than chasing dinosaurs. Becker is pining for Jess in an entertainingly adorable way, but is completely unable to bring himself to make a move. So he spends all his time baking things she likes in the hopes she might get a clue. Becker. Jess. Lots of chocolate and cakes. What more do you need for a feel-good fic? Summary: The baked goods in the break room were already a staple when Becker arrived at the ARC. Why I’m Reccing This: Working at the ARC is a rather stressful job, and they all deal with it in their own ways. Lester, it turns out, bakes. This fic is an entertaining Becker pov as he deals with the knowledge that Lester is a stress baker, and how their relationship evolves once Becker has realised that Lester does have feelings, after all. Why I’m Reccing This: The first Christmas after series 1 of Atlantis aired, there were a spate of fics involving Jason feeling homesick for Christmas, and his friends trying to cheer him up. This is one of the sweetest, with established Jason/Pythagoras, and Pythagoras attempting to recreate customs he knows practically nothing about in order to make Jason happy. It's just adorable. Summary: Jason drunkenly waxes lyrical about Christmas. Hercules and Pythagoras make it all better. Why I’m Reccing This: Another one from the ‘first Christmas in Atlantis’ spate, but where ‘A State of Mind’ was more of the fluffy angst and adorable comfort variety, this is of the humorous comfort variety as Hercules and Pythagoras attempt to recreate some approximation of Christmas for a very drunk Jason. It’s not the most promising of ‘Christmas’ celebrations, especially when the boys manage epic levels of ‘wrong end of the stick’ as regards certain aspects of the festival, but it’s the thought that counts, right? Summary: Medusa had always liked snakes. Why I’m Reccing This: This gorgeous bittersweet fic is more of the ‘hurt’ than the ‘comfort’ variety, and imagines a background and far more personality than the show ever gave us for poor Medusa, the girl who loves rocks and lizards, but who is ultimately doomed to be cursed with stone and snakes. Summary: DI Joseph Chandler is a complicated man with a good team. Can he overcome his personal issues in order to make a life for himself? Summary: "Nobody said you had to be the greatest detective that ever lived - only the best detective that you can be." Why I’m Reccing This: Great little vid featuring Chandler and his OCD moments, and what he does to deal with them (or in some case, *not* deal with them). As with rec 12, it’s a comfort routine/habit rather than food or item. Summary: Connor is badly injured and Ryan keeps a vigil by his hospital bed. Why I’m Reccing This: Connor/Ryan is such an adorable pairing, and one of my favourites in this fandom, and I love seeing whumped!Connor, so this fic is right up my street. It’s also a good opportunity to see usually hard-man Ryan worrying and taking care of Connor when he is seriously injured during an incursion, and how all the others rally round to look after Ryan when it all gets too much. Summary: Connor has a terrible accident and Ryan has to cope too. Why I’m Reccing This: Every now and then I like to wallow in a *really* angsty major injury/maiming type fic, and in fact this one was written for me as a birthday present (it’s slightly alarming how well my friends know my tastes!). And major injuries don’t come much more serious than permanent amputation. Of course, the best part of a serious injury type fic is not necessarily the injury itself, but more the comfort and angst that follows, which this fic delivers in spades as Connor and Ryan’s relationship begins to crack under the strain in the aftermath. Summary: Nick is finally discharged from hospital, but only on condition that he isn’t on his own at home. Why I’m Reccing This: I have a soft spot for Nick/Connor as a paring in this fandom, and this is a great hurt/comfort fic, not least because it’s nice to see Connor being the one taking care of someone (in this case, taking care of Nick when he comes out of hospital after surgery having survived Helen’s attempt to kill him), rather than Connor being the one who is hurt. It’s an interesting role reversal from the usual fandom whumped!Connor trope (see above for two examples!). Summary: An accident forces Becker to re-evaluate a few things. Why I’m Reccing This: This actually comes from the middle of a long running fic series, but can just about be read as a standalone unit. Becker receives a life-threatening injury after a dinosaur mistakes him for a chew-toy. This leads to much grumbling from Becker, and much worrying from Lester, and an awful lot of comfort and caretaking, all delivered with Lester’s usual level of sarcasm, which is always entertaining. Sometimes, though, they both drop their guard enough to realise just how much this incident has affected them both, and their relationship. Summary: Some scars are visible and some cannot be seen – yet they impact their bearer's life all the same. Why I’m Reccing This: This is a very lovely angsty hurt/comfort set in the aftermath of the end of series 2. Simon has tried to bury his memories of being cut open and experimented on by the scientists and doctors, has tried to hide the scars from everyone. But Kieren sees past the scars, to the man, and the motives, behind what happened to him, and together they both deal with their old scars. Summary: It even hurts to think right now but somewhere in his weary mind the thought does occur to him that if he can just find Pythagoras everything will be better. Pythagoras will help him; will look after him; will take the pain away and make him feel better. Why I’m Reccing This: I do love seeing Pythagoras in ‘healer’ mode, and this fic pushes his medical knowledge to the extreme when he is forced to perform surgery on Jason to save his best friend’s life. Summary: The cleaner is very good at his job, especially when it involves breaking things. Why I’m Reccing This: Epic Connor!whumping, when he is taken captive by one of the cleaner clones post series 2 and tortured for information. But Connor is stronger than the cleaner expects. Summary: Cutter's clone survived the bomb. Now she has to decide what to do with him. Why I’m Reccing This: Reggie has written a fair bit of fic about clone!Nick, including the incredibly long 'Parallel Lines' series, which unfortunately was difficult to include as a rec because it’s in multiple parts. This one-off fic, however, is a touching and slightly bittersweet take on how Jenny might have dealt with it if the clone of Nick had survived the bomb in 3.3. And here's the shiny banner for completing it! I looked at the prompts and thought it was going to be really difficult to find any for Atlantis fandom that fitted those prompts, so I was surtrised by how many I did manage to get. Belatedly, thank you for the recs! :) Also, Whitechapel recs! \o/ And the In the Flesh one looks good, I've never read any fic in that fandom. I was convinced there had to be some Whitechapel fics that would fit, but I really had to scramble at the last minute to find them, which made it all rather more stressful than it probably ought to have been! I have to admit that's the *only* In The Flesh fic I've ever read. The author is someone I know from Atlantis fandom, and I went looking to see what other stuff she writes and found that one. She's written another In The Flesh fic recently which I really want to read, but it's 40k and I can never find the right time to sit down and read that much in one go! 40k! I have a ton of long fic I want to get to but haven't yet, but I always space out those sorts of fics and read them over however long it takes me to read them. Which is sometimes quite a long time indeed! Mind if I post the 4 Atlantis recs on tumblr in your name (linking to this post)? Jennistar and thats_vexing are on tumblr and I'm sure they would love to know about it :) Plus it might attract more readers to these awesome stories! 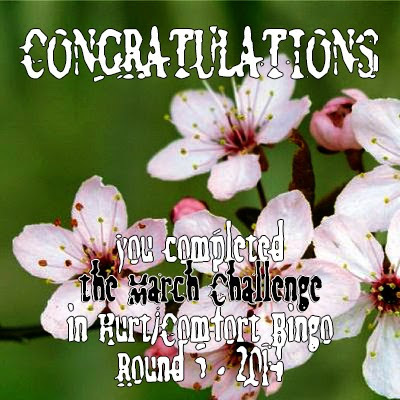 And congrats on completing the March challenge! Yes, feel free to spread the fic love! I was pimping Atlantis fics to someone yesterday as well. Someone commented on my lj on my Hercules/Pythagoras wallpapers, wishing there was more Herc/Py in the fandom, so I directed them at a few. It didn't take long - there's hardly any (and several of them are written by me!). Ahaha, thank you :)) And good of you to pimp more fics! I'm putting together my own rec list sloooowwwwllly but I had to stop reading for a while to work on my diploma project. STILL. Nothing can keep me away from Atlantis this weekend! Damn real life, always getting in the way of fic and fandom, lol!